I love bread and am learning to make my own sourdough. I often have too much bread on hand, especially bread I’ve let get stale. This recipe caught my eye because one only needs so many croutons and bread crumbs. 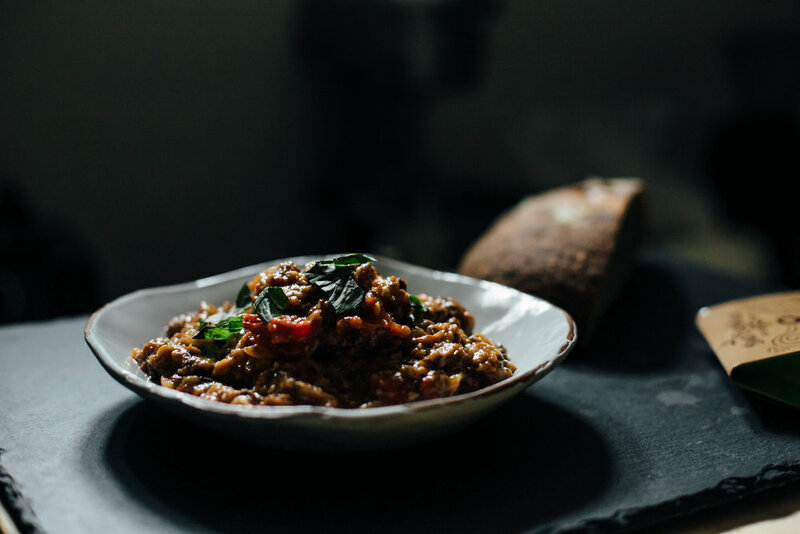 This dish is naturally vegan, simple, relies on kitchen staples and with the addition of the seaweed marinara blend your tomatoes gain a complexity of flavor that’s delicious but hard to completely describe. I’m adding this recipe to my go to list for those hectic days where I crave comfort food n ease. There is also plenty of room for adaptation. Try adding cannellini beans for a boost of protein. Fold in torn lacinato kale leaves in the final minutes of cooking for a dose of greens. Or do both! Next time I’d finish mine with a drizzle of good olive oil and a grating of parmesan (if not vegan) and I recommend you do the same. Heat olive oil over medium heat until warm in a dutch oven or medium saucepan. Add onion, cooking until soft, about 5-7 minutes, stirring often being careful not to let it brown or catch on the bottom of the pot. Add the garlic and red pepper flakes and cook until fragrant, about a minute, stirring constantly to prevent browning. Add the tomatoes and their juices, tomato paste, balsamic vinegar, red wine and Blue Evolution Seasoning and stir to combine. Bring to a simmer and cook for about 10 minutes allowing the tomatoes to reduce, stirring occasionally and breaking up the tomatoes with your spoon as you go. Taste and adjust seasoning, adding more balsamic if you want a touch more sweetness or more chile flakes for heat. You can also cook your tomatoes longer for a greater depth of flavor if your time allows. Stir the bread cubes into your tomato mixture. Add 4 cups of vegetable stock, half your basil, and 1⁄4-1⁄2 teaspoon of kosher salt depending on the saltiness of your vegetable stock. Return to a simmer and cook for about ten minutes breaking up the bread cubes as you go. You’re looking for a thick, oatmeal like consistency. If your soup gets too thick, add a bit more stock or water to achieve desired consistency. Fold in your remaining basil (saving a few ribbons for garnish) and taste and adjust seasoning as needed. Serve hot or warm drizzled with olive oil, a little parmesan and a few ribbons of basil. Notes: This reheats well but I find I need to add a little water to return it to a more soup like consistency. This can also be served room temperature, but I have yet to try it that way. Let us know if you do and what you think!